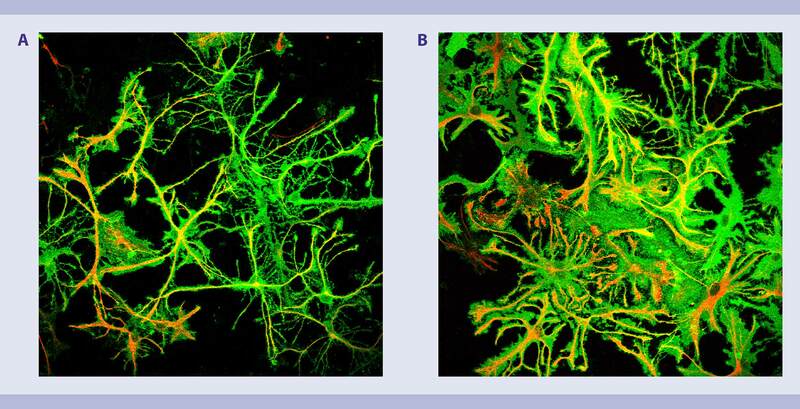 A workflow protocol to purify neural stem cells (NSCs) from wildtype mouse brain. This entire experimental setting resulted in highly pure (>95%) and viable NSCs (>90%) in less than 3 h.
First, an optimized automated dissociation protocol is applied, which ensures high viability and epitope integrity of the resulting single cell suspension. Then, NSCs are identified by detection of the exclusion markers CD24, Ter-119, and CD45 and the NSC specific markers GLAST and PlexinB2. Subsequently, purification of NSCs is carried out with the MACSQuant Tyto Sorter. A neurosphere assay can be performed to verify the viability and functionality of the sorted NSCs. MACSQuant Tyto Sorter is a multi-parameter cell sorting device that uses a micro-chip based sorting technology for sterile and gentle cell isolation. Unlike conventional droplet sorters, cells do not experience high pressures and no charge is applied, ensuring high viability and functionality. Dulbecco’s phosphate-buffered saline (D-PBS) with calcium, magnesium, glucose, and pyruvate. Keep buffer cold (2−8 °C). A pre-cooled (4°C) centrifuge with swinging bucket rotor is recommended. e. g., Heraeus® Multifuge 4KR by Thermo Fisher® Scientific. MACSQuantTyto Running Buffer (#130-107-206, #130-107-207). Degas buffer before use, as air bubbles could block the column. (Optional, for analysis only) Anti-EGF-Receptor antibody for flow cytometric analysis of activated and quiescent NSCs, e.g., ???????? Identification and sorting of NSCs is possible with SVZ tissue of one mouse. For subsequent neurosphere assay, it is recommended to dissociate SVZ tissue of at least 5 mice. Volumes given below are for SVZ tissue of 5 adult mice in 1980 μL enzyme mix. When working with less than SVZ tissue of x mice, use the same volumes as indicated. When working with higher tissue quantities, scale up all reagent volumes and total volumes accordingly. A maximum SVZ tissue of x mice per tube can be processed. Always use pre-cooled buffers and solutions (4 °C) and perform all steps on ice. Mich, J.K. et al. (2014) Elife. 2014 May 7;3:e02669. doi: 10.7554/eLife.02669.